Disclaimer: educational purpose only, these high voltages are lethal. Try at your own risk. Yes, we are back with our very favorite high voltage guides. I have been busy for past few weeks with college and stuff so couldn’t post anythings. anyways, as i have told you guys earlier, i had this Flyback transformer in my stock. So today i just thought about doing a proof of concept tutorial for it. If you open up your Old CRT TV set there is one picture tube. behind that tube there is one suction cup like thing. at the end of it you will see the thing like the one shown below. 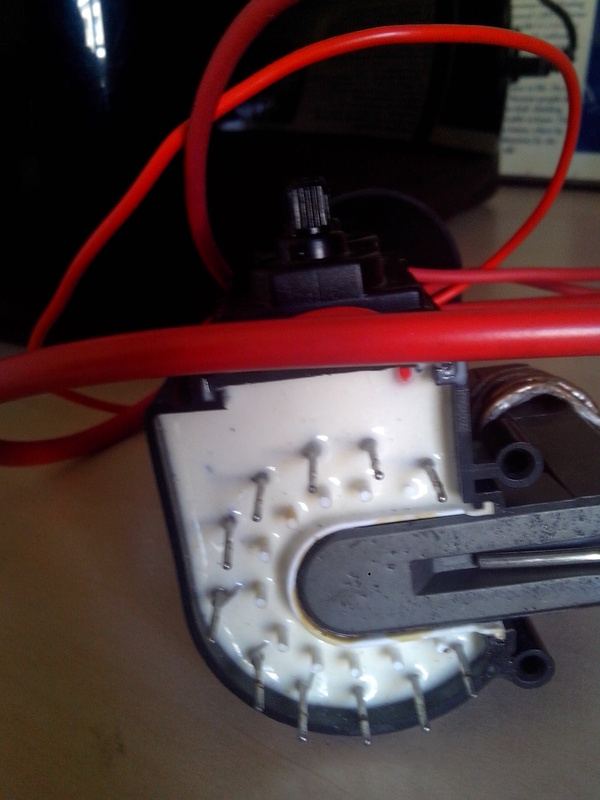 that is the flyback transformer. I am not going to go deep in how it works and all stuff. Go to the wiki you will find everything. Just know the thing that it is not a regular transformer, the winding is bit different and while stepping up the pulsating DC it stores and pushes out the power producing fat Arcs. Now you can just take out that flyback from your old TV if your mom allows that or just buy it from market, its really cheap. If you are planning to take out the one from your TV. Do remember to discharge that huge capacitor behind it b shorting its terminals. Or it will surely kill you. Now the step 0 is to identify the pins of this flyback. All of these have 10-11 pins from these you have to take out the 3 that are Primary(+), Primary(-) and High voltage ground. 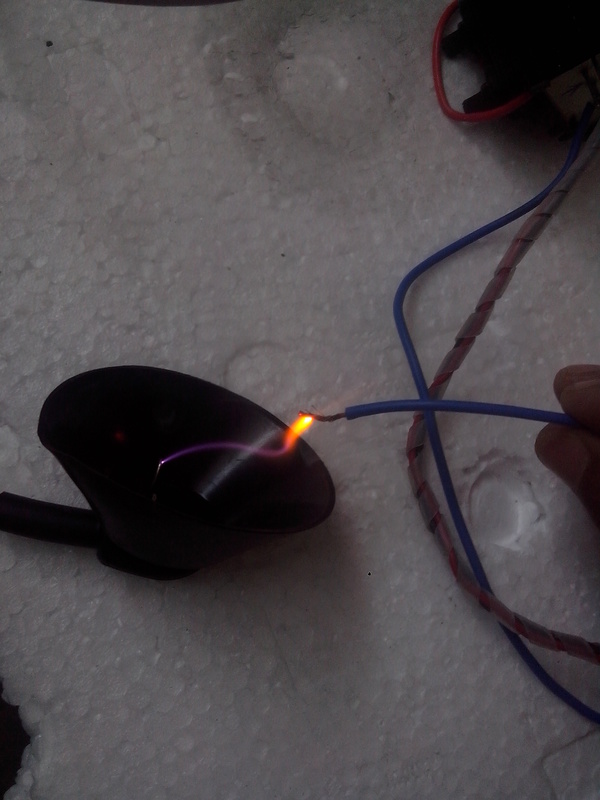 The high voltage output comes from that suction cup thing as you can see in the pics. 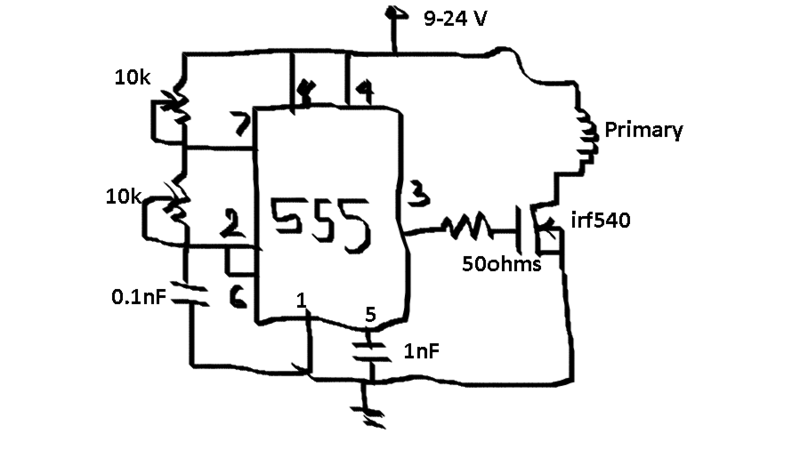 – A DC Source around 12-24 V.
Dont forget to put a huge Heatsing around mosfet or it will blow up. Now just connect the damn primary there. fire up your Power supply. And then just take that High voltage ground to the High voltage out and you will get some really beautiful Arcs. 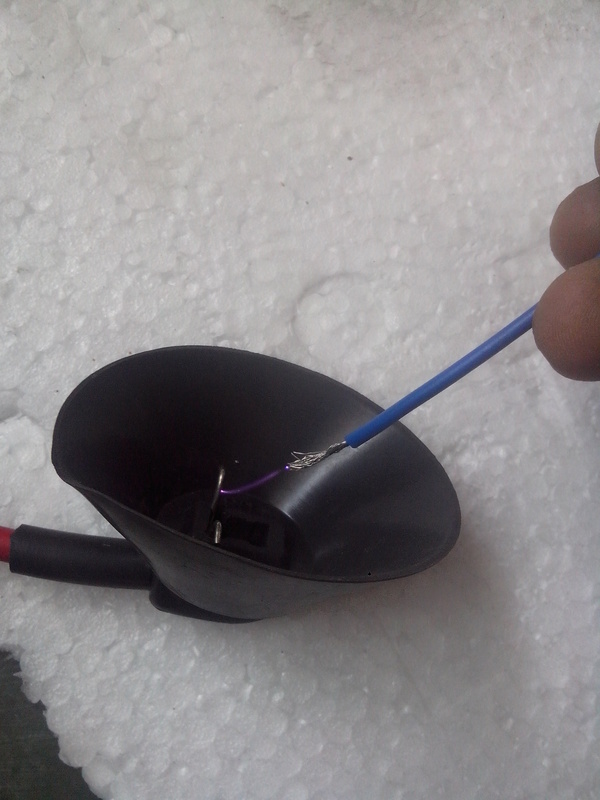 — Put the High voltage ground near High voltage output and adjust both the pots. The pots will define the frequency and duty cycle (read Astable Multivibrator). And as the flyback depends on the principle of resonance will fix the problem. Producing Music through the noise of these Arcs. P.S.– Fun facts… You can burn all sorts of stuff using this, we tried candles, papers cardboards, firecrackers. Also try adding some salt to it 😉 it burns real good. Just try not to kill yourself while doing this. 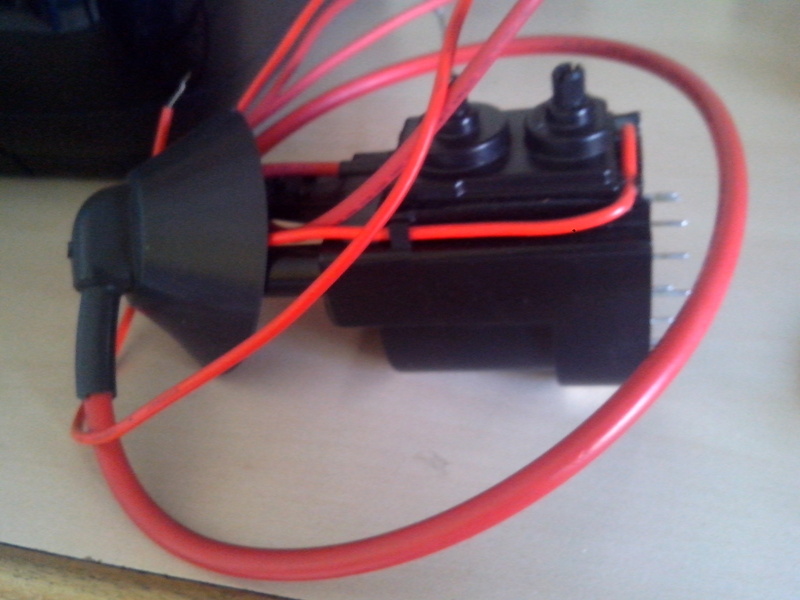 This entry was posted on March 29, 2014 by S4t4n in DIY stuff., High Voltage, Tutorial and tagged Arcs, Flyback Transformer driver, High Voltage.